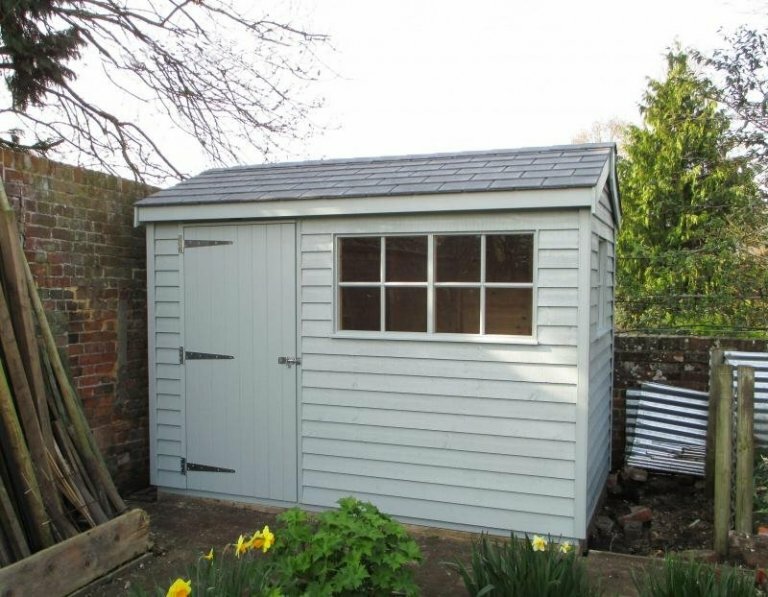 This Superior Shed has an apex roof, it is 1.8 x 3.0m in size, and it has been installed in a corner of our customer’s garden in Urchfont, Wiltshire to use as an attractive place to keep their gardening equipment inside. The weatherboard cladding the customer chose is more rustic in style than our standard shiplap cladding, and this choice fits in well with the Georgian windows, and the grey slate effect tiles to offer an overall traditional, country look to the shed. 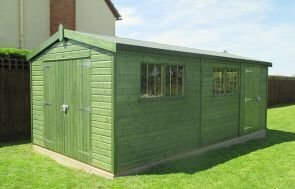 The paint system used on this shed is our opaque, multi-layered Valtti Paint Range, and the colour chosen is called Verdigris, which is a natural green/blue colour that will help the shed to blend in with its natural surroundings. There are no extra features internally, the customer wants it for the simple purpose of storage, but they wanted the outside of the shed to stand-out, becoming a focal point of their garden. If you like the look of this shed, and you would like to know more about our Garden Sheds, you can call us on 01760 444229 to speak to our helpful team, or you can come and visit one of our Show Centres across the country to come and see our buildings for yourself.